Charge a lot. OK, I’m half kidding. I don’t know how to charge either, but I do know people charge, like, $200 for a 5’x 5′ window painting. To me that’s a lot, but if you’re good, it’s definitely worth the business’ investment. Good luck! Olá, eu estou querendo pintar a vtrine da minha loja, mas sem fazer desenhos, quero um chapado, apenas para tirar a visibilidade de quem está do lado de fora. Será que você poderia me indicar qual tinta utilizar e a técnica mais adequada? Desde já agardeço a atenção. Since you don’t recommend painting on the inside, could you use an acrylic paint on the outside and have it stand up to weather for quite a while? Our business is VERY close to the road and in the winter we get a lot of spray up from the snow plows and traffic. This won’t be a holiday design but rather something that would be up year round. Oh, acrylic is perfect for your situation! The colors will be brighter and it will certainly stand up to weather of all kinds. When it comes time to take it off, you will probably have to put a warm, wet towel over it to soften the paint before scraping it off with a blade (which is why I wanted to switch to tempera). Good luck! what kind of acrylic do you recommend? 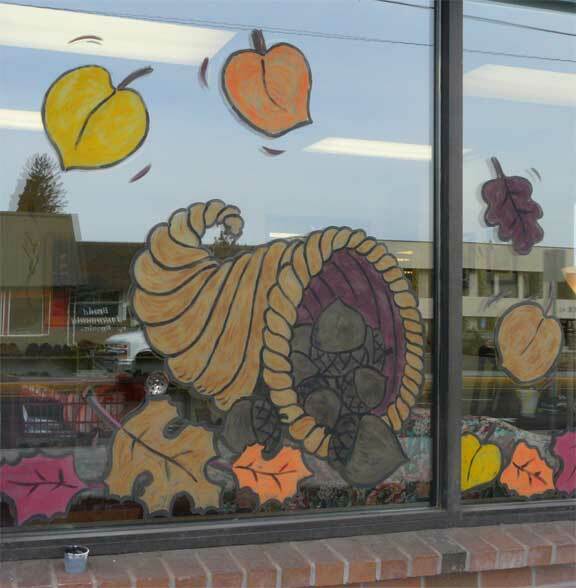 I am helping decorate studio windows and was looking into vinyl but it would just end up so expensive. Should dish soap be mixed with the acrylic too? In your experience is more than one coat needed or do you add white to the acrylic just like the tempera? No dish soap is needed with acrylic. And now that you mention it, it may be a good idea to add a BIT of white to the colors so it stands out against the dark store interior better. Try a small sample design with and without white to see how you like it. Good luck! 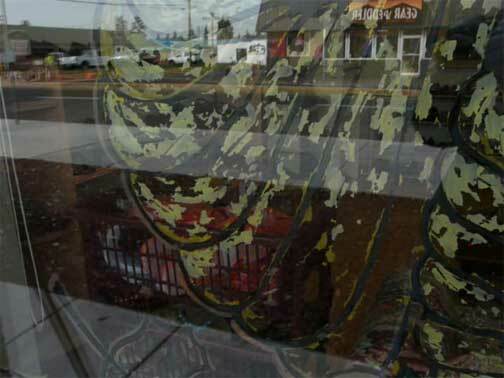 I paint windows in Washington State… Lots of rain here. I use acrylic… but I do a first layer in white! Then, when I add the color, it really pops! PLUS… I leave a bit of the background white showing around the edge to make it pop MORE! I find that the metalic and pearl acrylics are harder to get off. Mostly everything else comes off with a good soaking and a very sharp blade. New scraping blade for each project. I have also done residential works for the holidays! Lots of fun! Corrine, this is great info! Thanks. 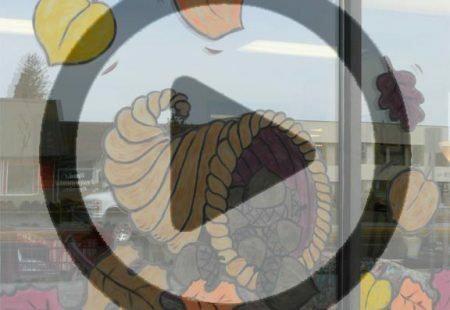 I’m curious–do you get paid to do window paintings? How much do you charge? I think a lot of people could use a little extra holiday money, so if you have experience in charging, we could use your advice. Thanks! How does the tempera paint come off? Does the rain wash it right off? Melanie, I heard that you shouldn’t do this type of window painting if you live in a rainy climate. But the window I painted two months ago is still intact, and we’ve had lots of rain. To clean it, just take a wet rag and rub it off. I also used a squeegie (sp?) from top to bottom to get the glass clean. Anne, que pena que não deu certo a primeira vez. Mas não desista tão logo. Use tinta guache em pó e misture bem com um pouquinho de agua (a mistura tem que ficar meio grossa), adicione um pouco de pó branco e misture outra vez. Só depois de verificar que a tinta está bem cremosa, adicione um pouco de sabão líquido. Este método funcionou muito bem pra mim. I wish you lived close to me I’d have you paint my house windows. What a fun holiday theme! I’ve never used tempera paints but I am sure your tips will make someone who does very happy. Any idea why it flakes in the fist place? I can’t wait to see more of the windows you’ve done any chance we’ll see pics soon?